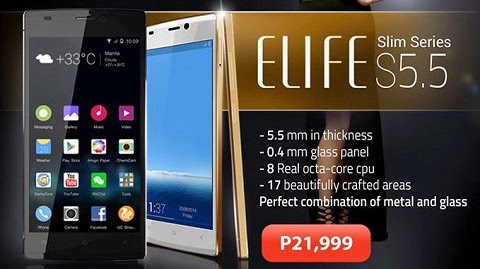 Gionee ELIFE S5.5 officially launched in the country with packs of specs including a MediaTek’s MT6592 octa-core chip with Mali-450MP4 GPU, 2GB RAM, and 16GB onboard storage for PhP 21,999. The S5.5 sports 5-inch Super AMOLED display with 1920 x 1080 screen resolution. It also has a Corning Gorilla Glass 3 in it's front and back. The company claims the S5.5 with the first 5.5mm thin smartphone that is made of 98% metal and glass. Pinaka manipis na smartphone pero expensive.